From the porch of the Battle Harbour Inn in the historic fishing village of Battle Harbour at the entrance to the St. Lewis Inlet in Southern Labrador, Canada, one can see the lights illuminating on the general store and other buildings. The fog thickens and blocks out the buildings in the backdrop as night settles in around Battle Harbour. The Battle Harbour Inn sits on top of the hill overlooking the other buildings and has five separate rooms providing accommodation for those guests wanting to stay in this unique place and explore. A bathroom, kitchen, dining room and sitting room are also located at the inn for all guest to share while staying here. Paths lead around Battle Harbour where visitors can explore the island on foot, some which were used by fishermen during the 18th, 19th and 20th centuries. 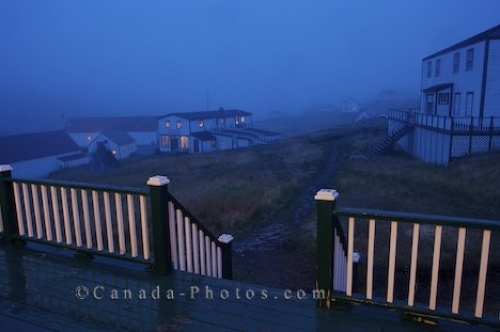 Picture of the fog at night settling in around Battle Harbour seen from the Battle Harbour Inn in Southern Labrador, Canada. General Store and various buildings seen from the Battle Harbour Inn on a foggy evening in the historic fishing village of Battle Harbour situated on Battle Island at the entrance to the St Lewis Inlet, Viking Trail, Trails to the Vikings, Southern Labrador, Labrador, Atlantic Canada, Canada.